We need an independent movement that takes no corporate money from the oligarchs on Wall Street! Speaking through the megaphone at a rally and march for Bernie at New York City’s Union Square, Socialist Alternative activist Eljeer Hawkins proclaimed, “We need a party of the 99%!” The crowd of over 1,000 Bernie supporters responded with energetic cheers. The March For Bernie, which took place on February 27, was the second in New York, this time organized by #Movement4Bernie, and was joined by marches in over 70 cities across the country the same day. 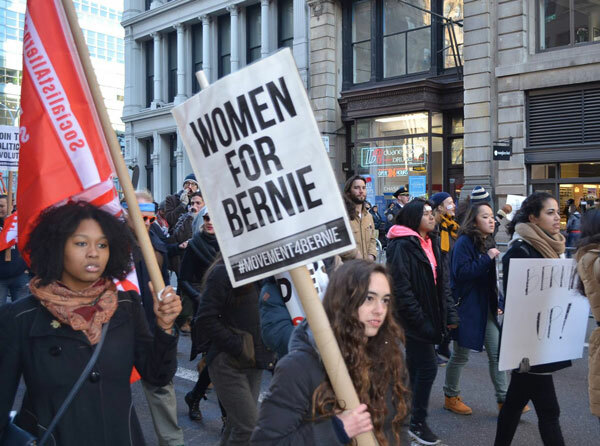 The march in New York was lead by a Women for Bernie contingent which highlighted the tremendous support Bernie has among women despite the appeal of Hillary Clinton potentially becoming the first woman president. A Women for Bernie speaker explained that Bernie’s issues, such as a single-payer health-care system, a $15 an hour minimum wage, and free college education, are women’s issues too. She went on to explain that the fight for women’s equality is not just about “breaking glass ceilings, but tearing down the walls” of the system that reinforces sexism throughout our society. The march drew a very young and energetic crowd most of whom are very new to politics. In New York and around the nation, Bernie’s campaign is capturing the imagination of millions and raising their sights about what is possible, and this was reflected in the composition of the crowd. Symbolically, the march ended at Zuccotti park, the birthplace of Occupy Wall Street which in many ways opened up the discussion on inequality in U.S. society that Bernie and his supporters are continuing. The outpouring of grassroots support for Bernie has been a key feature of his campaign. The first March For Bernie in New York, on January 30, was organized by Millennials for Bernie along with a network of social media groups. In fact, organizing for Bernie in New York started long before these successful marches. When Bernie Sanders first announced that he was running for president very few people knew who he was. Nonetheless, in the weeks that followed, a handful of activists in New York began organizing and launched what eventually became Team Bernie NY which now has thousands of volunteers actively campaigning for Bernie. Bernie has scored some big wins, but the hill he has to climb is steep and getting steeper.. The achievements of this campaign have been nothing short of an historic challenge to the corporate establishment, but even with all this grassroots support it is looking less and less likely the he will be able to win the Democratic Party nomination. This is not because Bernie is unelectable, as the corporate media argues; in fact polls show Bernie wins against any Republican opponent in November by larger margins than Clinton. The real reason is the corporate-dominated Democratic Party primary process has proved to be hostile ground. Bernie’s campaign has already demonstrated the massive hunger among millions of people in this country for a real alternative to the corporate politics that dominates the two-party system. There is a real potential to build something new. Socialist Alternative launched #Movement4Bernie to support Bernie’s campaign. We made the case that Bernie can win, but that it would take a massive upheaval of working people to overcome the opposition of big business and all their tools including the corporate media, PACs, and the Democratic Party itself. In New York, we’ve organized and participated in marches for Bernie, public meetings, and street activity consistently raising the need to build a movement from below and warning that the Democratic Party establishment could eventually undermine our effort if we do not build independently of the billionaire class and their candidates. Now there is a danger that our movement will be cut short if we’re told the only choice is to get behind Clinton, an unmistakable representative of the billionaire class. Socialist Alternative has called on Bernie Sanders to run as an independent to keep the movement going if he loses the primary. The general election will be when the most people will be tuned into politics. That’s when we need Bernie’s message more than ever. We need to keep this movement going all the way through November and after. On March 19 there will be a protest against Trump in New York City and on April 16 there will be another march for Bernie in the final weekend before the New York primaries. #Movement4Bernie in New York will be there and will continue to campaign for Bernie in the streets. At the same time, we will also raise the urgent need for a movement to continue to fight for free college tuition, single-payer healthcare, a $15 an hour minimum wage, and to continue the political revolution against the billionaire class. Next articleWhat Strategy to Stop Trump?